Queenstown is an exhilarating, year-round, alpine resort, perfect for adventurers and leisure seekers alike. Nestled on the shores of Lake Wakatipua and overlooked by the majestic Southern Alps, the town was named because it was "fit for Queen Victoria". Today, Queenstown is internationally recognised as New Zealand's premier visitor destination. But Queenstown has more than just breathtaking scenery and a diverse range of attractions - it's the people that visitors find enchanting. In fact, Queenstown has consistently been voted Friendliest Foreign City in a poll of Conde Nast Traveler readers, a top US travel publication. Queenstown first won the award in 1996. Queenstown attracts around 1.9 million visitors each year. Queenstown boasts the largest range of adventure activities in the southern hemisphere. The compact town centre is just one square kilometre in size. Queenstown has a resident population of around 23,000, swelling to 45,000+ in peak visitor periods. Population growth runs at approximately 6 per cent each year. Queenstown Airport is only 10 minutes from central Queenstown. There are international direct flights to Melbourne, Sydney, and Brisbane and domestic services to Christchurch, Wellington and Auckland. 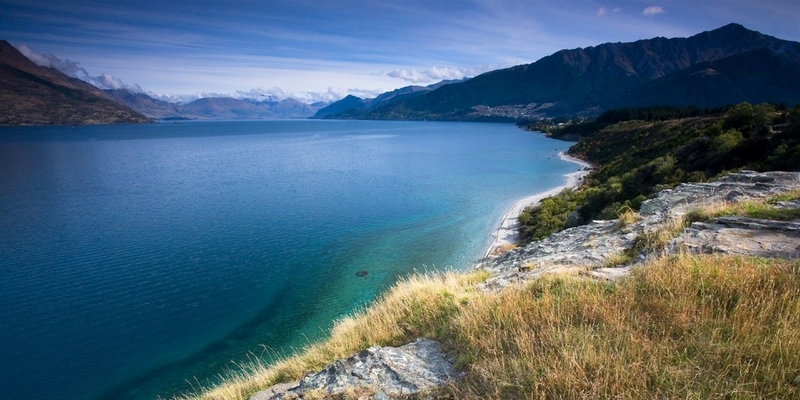 Queenstown and the Southern Lakes region was voted one of the Top 10 Places in the World to visit by Lonely Planet. Queenstown is becoming a popular destination for television productions and film. After the success of Peter Jacksons' Lord of the Rings Trilogy, filming of The Hobbit took place in December 2011 in Glenorchy. Queenstown has also featured in the American productions of The Biggest Loser and The Bachelor gaining world wide recognition. Queenstown is host to numerous events throughout the year from concerts, festivals, food and wine, sporting events, conferences, markets and family fun events to activities. Queenstown's distinct seasons are characterised by a winter with beautiful snow-capped mountains and crisp, clear days and a summer that brings hot, dry days and clear skies and temperatures occasionally reaching 30 degrees celsius. It's rare for snow to fall at town level: it only occurs a few times per year. Spring thaws winter with temperatures between 8 and 22 degrees and stunning fruit trees bubble with blossom. In autumn, the landscape bursts into a blaze of red and gold bringing temperate weather ranging between 12 and 25 degrees. The average temperature in Queenstown is 17 degrees while the average winter temperature is 6 degrees. Queenstown has an average of 1921 sunshine hours per year and the average annual rainfall is 741mm. The urban roads in and around Queenstown are of excellent condition and provide outstanding views. However, many roads in New Zealand are narrow, winding and moutainous - and Queenstown is no exception. In winter, care must be taken to allow for the hazards of ice: chains should be carried and 4WDs used where possible, especially if accessing mountain or ski field roads. Roads can be busy in Frankton and the town centre but it is largely free-flowing. Travel times between Queenstown and other major population centres are estimated below. These travel times are calculated for driving at 80 to 100 km per hour on open stretches, with an allowance for traffic delays, petrol stops and refreshments.